Here it is nine full days after Thanksgiving and we are still enjoying the gifts given up by our 21 pound Plainville Farms Thanksgiving turkey. 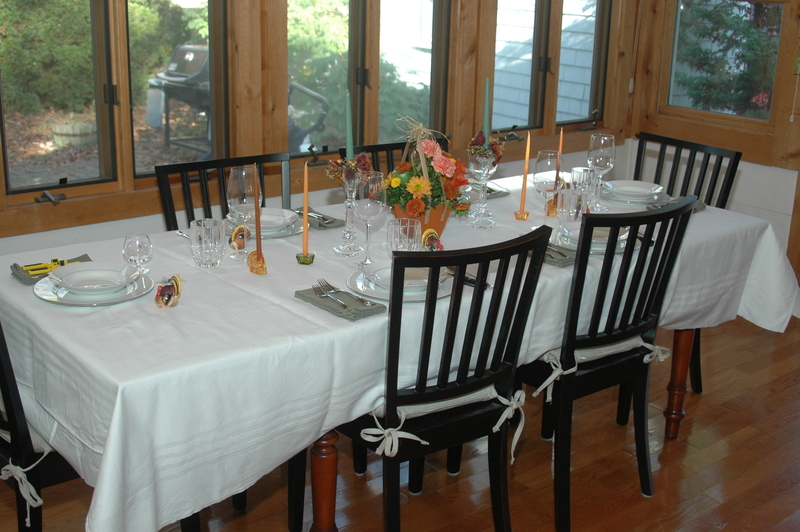 The turkey dinner and its side dishes are but a memory. The leftovers of hot turkey sandwiches smothered in gravy, accompanied by re-heated stuffing and the counterpoint of tart cranberry sauce, as well as cold turkey sandwiches on rye bread slathered with homemade Russian dressing disappeared days ago; and now the last of the Turkey Soup is gone as well. I have had my fill of Tom Turkey and if I don’t meet him again until next Thanksgiving, that will be just fine with me. But it is remarkable how many meals one can squeeze out of a single bird. Our Thanksgiving feast this year started out with a gift of more than two dozen deliciously sweet and briny East Dennis Oysters™ compliments of John and Stephanie Lowell of the East Dennis Oyster Farm and our mutual friend Serge. I first became acquainted with these briny delights in Biloxi, Mississippi while on the payroll of Uncle Sam and stationed at Keesler AFB. Having had a long established relationship with another hard-shelled creature of the sea, Cherrystone clams, I never felt the need to meet their cousin. 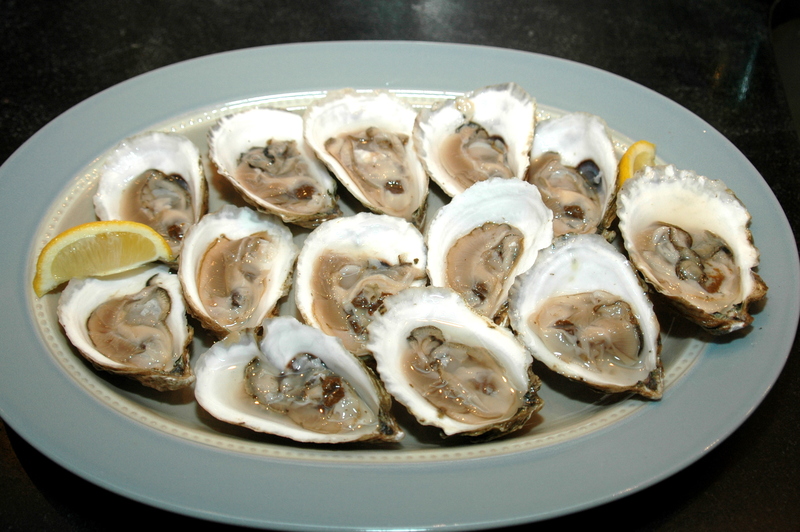 But clams were not readily available on the Gulf Coast, while oysters were in abundance, thus began a long-standing conflict; clams or oysters or both! I am an able-bodied clam shucker, but never developed the skill of oyster shucking, so have always had to depend on the kindness of strangers. Our son-in-law, having grown up on the North Shore of Boston and on Martha’s Vineyard, is a skilled oyster shucker. He was assigned the task of prying these creatures from their shells, and as you can see from the picture, did a remarkable job in doing so. My wife, bravely tried her first raw oyster, but happily for the rest of us, demurred from having a second. As a result, our two daughters, son-in-law and I finished them off in a flash, washing them down with a well-chilled bottle of Crémant de Loire. By the time we finished off the oysters, the main meal was ready. 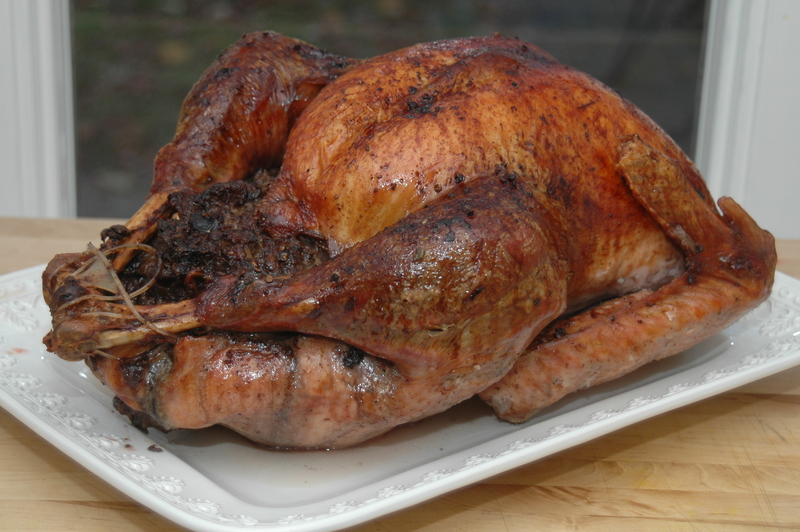 The Roast Turkey, having been filled with Dorothea’s Italian Sausage and Mushroom Stuffing, was waiting to be carved. I dutifully performed that task while my wife readied the delicious Bourbon Sweet Potatoes and the additional side dishes of Brussel Sprouts Roasted with Hazelnuts and Cranberry Sauce. 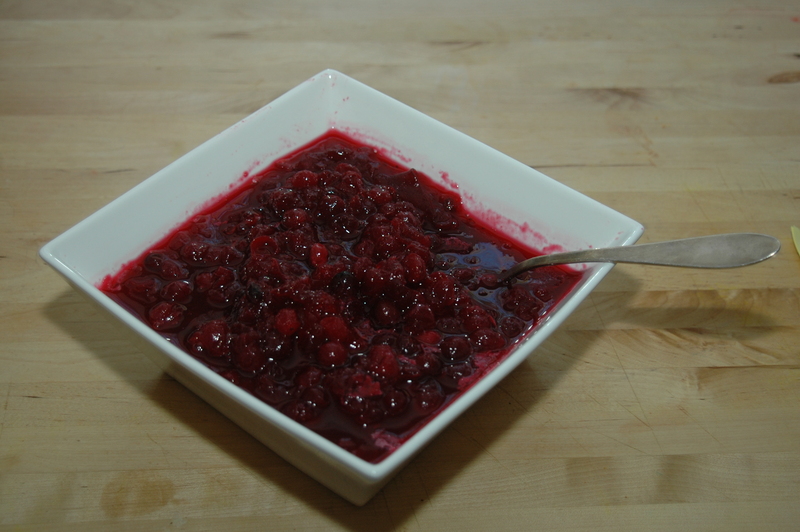 The latter was prepared by following the recipe on the bag of fresh cranberries, as opposed to opening a can. Sitting around our harvest table, with no gift-giving, or tinsel, or Christmas music to distract my thoughts, I reflected upon how fortunate I was to be surrounded by the love of our ever-growing family, which over the past 40 years has grown from two to seven. Beautiful meal and wonderful family memories. Thank you. It is a great family event and these friends are family. Have a wonderful Thanksgiving. Thanksgiving is less than two weeks away and you probably already have your meal all planned out, Turkey, Gravy, Stuffing and Sides. If that’s you, well congratulations. But if you’ve been distracted by life, overwhelmed by work and family and haven’t yet had the time to think about the upcoming holiday feast, The Literate Chef to your rescue. Right here are all of the details for a sumptuous feast. Happy Thanksgiving!